The week of action against Fortress continues in Florida with protesters targeting two companies connected with Fortress Investment Group, Legg Mason and Flagler. The Legg Mason Miami office sits on the 15th floor of a giant high-rise. Activists quickly hurried into the building, past those in the lobby, and into an elevator. After a quick ride 15 stories up, we exited the elevator and saw the glass doors with Legg Mason etched into them. There was a meeting going on two sheets of glass ahead of us. 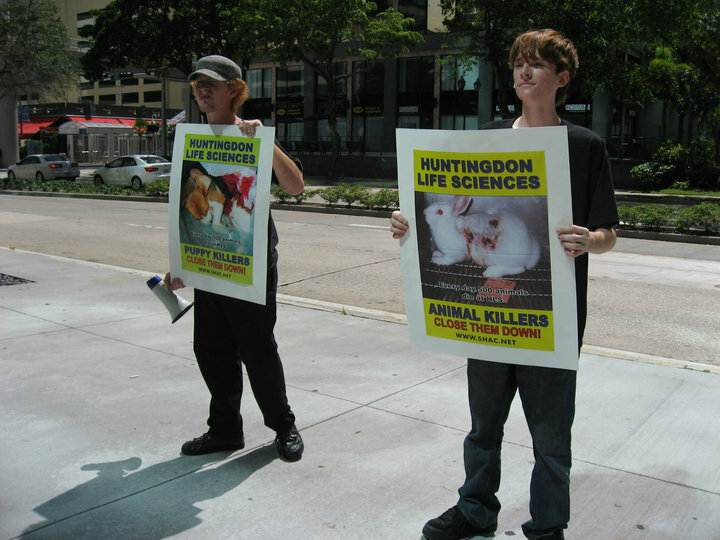 We held our signs against the glass, while a member of our group knocked on the door and announced why we were there. Chanting started soon after. A minute or two passed before security arrived and escorted us out. This did not stop us. We chanted in front of the building and passed out leaflets to the “workers” and passers by of the building for an hour. Legg Mason are shareholders in Fortress Investment, the greedy capitalists primarily responsible for keeping the beagle killers, rabbit mutilators, and primate vivisectors at Huntingdon Life Sciences from shutting down. The demise of HLS will save countless animals from tortured lives and bloody deaths at the hands of cowardly vivisectors. 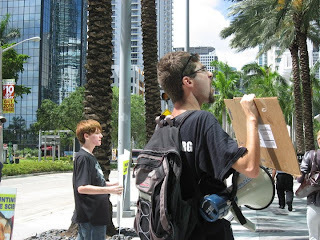 Not satisfied with only protesting one HLS enabler, Legg Mason, we decided to return to Flagler, a subsidiary of Fortress with a dirty history of exploitation here in South Florida. With two megaphones, we vocally battered away at the building that protects their peace of mind. A security guard for the bank on the first floor told us we had to cross the street to protest, but knowing our rights, we stood our ground and he was forced to hear the truth about Filthy Flagler on the 4th floor and the puppy killers at HLS. After about 30 minutes, through sun and rain we made our message heard.